Dave Matranga's great baseball memory. In the world of sports, athletes often dedicate their entire lives to reaching the pinnacle of their profession, but for many, life at the top can be short-lived. Sometimes all a player gets to experience at the highest level is one minute on the court, one trip to the plate, one shot on goal or one checkered flag, but more often than not, that fleeting moment in the spotlight is a story all its own. This is One and Done, a FOX Sports series profiling athletes, their paths to success and the stories behind some of sports’ most ephemeral brushes with glory. The state of Texas is still waiting to see whether the Astros and Rangers will advance in their respective ALDS series, but should the teams ultimately meet in the playoffs for the first time, it still may only be the second-most notable matchup between the Lone Star State rivals in the eyes of David Matranga. 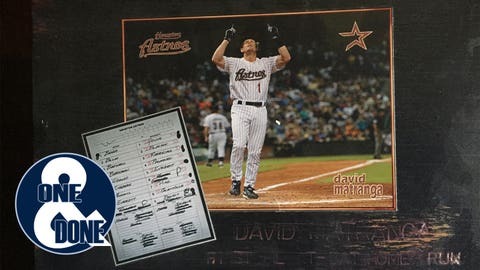 A longtime ballplayer and current agent, Matranga opened his major-league career with a home run for the Astros in a Silver Boot Series game against the Rangers during the summer of 2003. It turned out to be Matranga’s only career hit, as well, and while some others in Matranga’s shoes may lament not having more opportunities, Matranga says his career was a dream come true for the SoCal native who wanted nothing more from life than to play in the major leagues. "It was the pinnacle of my life," Matranga said of his lone big-league homer. "I’d finally made it to where I wanted to be and where so few people are able to go. Would I have liked to have stayed in for 10 years and made $50 million? Of course, we all would have. But that’s just not the way it was." Raised in Orange, Calif., Matranga lived so close to Angel Stadium as a kid that he could see the ballpark lights from his house. Matranga went to games regularly growing up and from a young age dreamed of one day taking the field at the park as a big-league ballplayer. "It was the pinnacle of my life." "Baseball was everything to me," Matranga said. "It started when I was 6 or 7 years old and that’s all I ever remember doing as a young kid, and all I ever really wanted to be. I didn’t necessarily know if I’d ever have the chance to go on and play past high school or college. I was one of the smaller kids growing up. I had good talent and I was pretty strong and athletic for my size, but you never really know." As he grew up, however, Matranga began to come into his own as a player and it soon became clear he’d have a chance at the next level. He batted .494 as a senior at Orange High School and in 1995, he played on the U.S. Junior National team that won gold in the Junior Olympics. Matranga eventually earned a scholarship to play about 65 miles up the coast at Pepperdine, where he hit .300 with 20 homers and 103 RBI in three seasons. In 1998, after Matranga’s junior season with the Waves, the Houston Astros made him their sixth-round pick, taking him with the 182nd overall pick — one spot after the Angels, Matranga’s hometown team, selected a different shortstop, Jay Hood. Early on in his minor-league career, Matranga showed some promise, but perhaps not enough to think he’d make a splash with a major-league club. Then in the offseason following his first Double-A campaign in 2000, Matranga learned that the organization was interested in looking at him as a utility player — the "kiss of death" for young minor leaguers’ big-league dreams, as Matranga put it. So that winter, he got serious about working out and entered into a program with friend and fellow minor leaguer Tim DeCinces, son of longtime Orioles and Angels third baseman Doug DeCinces. The following season, Matranga’s commitment to improvement showed, as Matranga hit .303 with 11 homers and 63 RBI between Double-A Round Rock and four games at Triple-A New Orleans. "After that, I was in Triple-A full time, played a lot, had a great year (.273 batting average, .982 fielding percentage between second base and shortstop), and I think that 2002 was the year that (Astros general manager) Gerry Hunsicker kind of made comments to my agent at the time that, ‘Hey, Dave’s done a lot, he’s definitely earned an opportunity to play in the major leagues,’" Matranga said. "He said, ‘He’s shown us what he’s about, he’s been resilient, and he’s going to get a shot.’"
Then in 2003, Matranga finally got his big-league break, although it took two call-ups before he truly got a chance. Early in the ’03 season, Astros shortstop Julio Lugo was arrested after allegedly assaulting his wife. The next day, the team designated him for assignment, and because rules dictated that Lugo’s replacement had to be someone who was not on the 40-man roster, it was Matranga who got the call to join the big club. "I wasn’t super privy to what was going on, so I wasn’t necessarily sure what was going on at the time when I got the call-up," Matranga said. "Tim Purpura was the assistant GM at the time, and he was the one that called me. He was excited about it, and it sounded like it was a big deal to him like it was a big deal to me. "… I knew the instant I hit it that it was a home run." "It’s that call that every single minor-league player dreams of getting. You’re in the minor leagues, you’re struggling, you can hardly make ends meet, you can hardly pay your rent, you’re struggling to play clubbies’ dues. So at the time, when I got the phone call, it was like, ‘Oh my gosh, this is unbelievable.’"
Except Matranga didn’t appear in that night’s game against Atlanta and was reassigned to Triple-A the next day in favor of Adam Everett, the organization’s heir apparent at shortstop. After the demotion, Matranga remained at Triple-A and was hitting .265 with two homers and 19 RBI through 60 games when he was recalled in late June to replace Jeff Kent, who was on the DL with a wrist injury. This time around, however, Matranga did get into a game, and he didn’t have to wait too long to get his first true taste of the majors. The night of his promotion, June 27, 2003, manager Jimy Williams called on Matranga to bat for pitcher Nate Bland with the Astros trailing the Rangers 4-3 in the bottom of the fifth. "I remember one of the bench coaches coming up to me and said, ‘Hey Dave, you’re hitting, get a bat,’" Matranga said. "I didn’t have much time to think about it, and maybe it was planned that way so that I didn’t have to think about it. But I was kind of ready, I knew where my stuff was and it was like, ‘This is the opportunity everybody talks about.’ It’s your first AB, you’re up on the Jumbotron, playing under the big lights, and I vividly remember doing my best to slow my mind down and control myself in a big situation." Matranga says that before the game, he stepped in the batter’s box at Minute Maid Park to get a sense of what the moment might feel like, and when he stepped to the plate against the Rangers’ Joaquin Benoit — using a bat borrowed from minor-league teammate Alan Zinter, now a hitting coach with the Astros — he had a plan of attack in mind. "I didn’t just want to go up there and swing at three pitches that weren’t even close to the zone and go back like, ‘What the heck just happened?’" Matranga said. "So I knew with 100 percent certainty that I was not going to swing at the first pitch. There was no way I was going to swing at the first pitch, tap something back to the pitcher and have it be over with. (Benoit) was a guy that I’d faced in the minor leagues coming up, so I’d seen him, but I just wanted to see what he looked like, see a pitch in a big-league ballpark." Benoit threw a first-pitch strike on the outside corner, then missed outside with another fastball near the same spot. With the count 1-1, Matranga says he was anticipating either a slider away or another fastball or sinker in and decided to sit on a fastball inside. "Sure enough, here comes a fastball that kind of started over the middle of the plate, then dove down and in, and I can see it like it was yesterday," Matranga said. "I can see the pitch coming out of his hand. I can see the location. I can see the ball coming in. I can see the ball coming off my bat. I can bring myself back to that moment like it was yesterday, and I knew the instant I hit it that it was a home run." As he rounded the bases, trotting past an infield of past and future All-Stars in Rafael Palmeiro, Michael Young, Alex Rodriguez and Hank Blalock, Matranga thought of his father, Dan, and what the moment might mean to him. 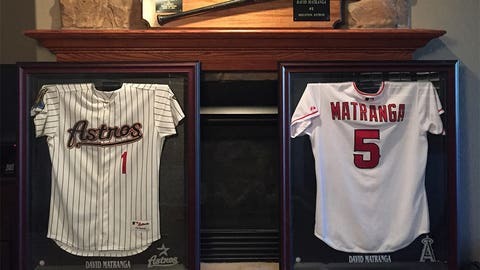 Dan Matranga passed away in 1998, two months into his son’s professional career, and throughout Matranga’s career, he kept a photo of himself and his father in his cap. "I wore the same picture in my hat for 12 years, had it with me that night, and as I was rounding the bases, for me it was like my whole career was flashing in front of my eyes," Matranga said. Had his dad had the chance, he’d have certainly been there to root on Matranga in his first big-league at-bat, too — Matranga said his dad "followed him everywhere" throughout his career. So as Matranga crossed over home plate, he pointed to the sky to honor his No. 1 fan. "Gene Lamont was coaching third base, and as I was rounding third base, I started to get choked up," Matranga said. "I remember thinking, ‘Man you’re on national TV, you better get it together.’ I hear some stories of people saying, ‘Man, it happened so fast, I don’t even remember it,’ but for me, I really tried to take in the moment, and I have a lot of great memories of it. " Unfortunately, the first highlight of Matranga’s major-league career would also be one of the last. Over the next three weeks, Matranga received four more pinch-hit opportunities and went 0 for 4, his efforts amounting to a swinging strikeout against Valerio De Los Santos, a 5-3 groundout off John Riedling, a swinging strikeout against Scott Williamson and a pop-out to second off Brian Reith. In mid-July Matranga was sent back to Triple-A, and after spending all of 2004 at Double-A, he was granted free agency. From there, Matranga signed with the Angels, finally fulfilling a dream nearly three decades in the making. While he did not make the Opening Day roster, an injury to Lou Merloni gave Matranga the call-up he’d been waiting his whole life to receive. On April 28, 2005, his contract was purchased from Triple-A, and on May 8, he finally stepped in the Angel Stadium batter’s box for the first time. "I’d been in that ballpark many, many times growing up but I don’t recall ever being on the field, and I was never on the field until I was wearing an Angels uniform," Matranga said. "I was up there for two weeks or close to it and I vividly remember we were losing big and going out there and getting choked up knowing that I was going on the field as a member of the major-league Angels." And so the result — a game-ending 6-3 groundout off Matt Ginter — didn’t matter nearly as much as simply being there on Mother’s Day, with his mom and extended family watching from the stands and his dad, as he always did, rooting him on from above. "It was a flash in the pan that nobody really cared about or realized what was happening, but there were a lot of people in that community who knew me from my Little League days, people who I’d known in Orange, people who were following what was going on," Matranga said. "So just that brief moment in time, getting an AB with the Angels and getting to wear their uniform was incredible." Three days later, Matranga was sent down to the minors for the final time, and after four more seasons toiling away at Triple-A for the Padres, Rangers, Royals and Marlins — he got his home run ball signed by Benoit during the stop in Texas — Matranga finally called it quits after the 2009 season, at age 32. "I had some offers to go play," Matranga said of the decision to retire. "The White Sox were calling and some other teams were calling, but what were the realistic possibilities of me going up and getting significant time, making significant money at the age of 32, 33 years old? You can’t chase the carrot forever." Instead, Matranga turned his attention toward becoming an agent and eventually went on to work with his longtime agent, Page Odle, at PSI Sports Management. Now Matranga makes his living advising players, drawing on his own personal experience to help others on the same journey. While Matranga — like every competitor — would have liked to have done more as a player, himself, he’s still grateful for what he did accomplish on the field. "I never let myself go to a place where I felt like baseball owed me or anybody anything," Matranga said. "It gave me an opportunity to play professional baseball, something millions of players that have come before me and will come after me hope and wish they’ll be able to do, and I got to do it for 12 years. I don’t take that for granted. "Just because I only had six at-bats in the big leagues and only 42 days, I don’t look at it like I was screwed in some way. I look at it like that was my opportunity and I did everything that I could with it."